15M four years on: will an Indignado have to shoot an elephant? A number of those who occupied the central squares of major Spanish capitals four years ago are set to win seats in their city councils or regional parliaments in the upcoming elections. Will they have to shoot the proverbial elephant? Español. Demotix/Nathalie Paco. Some rights reserved.The former Spanish ambassador to the UK, Mr. Carles Casajoana, said recently in a conference about the exercise of power: “Sooner or later, every politician has to shoot an elephant”. Recalling the origins of the Spanish Indignados movement in May 2011, one could argue that everything started, indeed, with one elephant shot dead. In May 2010, the Socialist Prime Minister, José Luis Rodriguez Zapatero, received two hot-line calls: one from President Obama and one from Chancellor Merkel. They both urged him to take a U-turn in his economic policy: to cut down major social expenses immediately and to swiftly implement an aggressive austerity fiscal policy. Spain, like the other southern European countries, was facing the deepest recession since WW2. Prime Minister Zapatero was arm-twisted into carrying out an express reform of the Constitution in order to introduce an extraordinary clause on public deficit limitation that would put an end to his welfare policies. He was forced to shoot an elephant. As many readers will recall, “Shooting an Elephant” is the title of a celebrated short autobiographical essay by George Orwell. The writer evokes an occasion when, as a young serviceman in the Indian Imperial Police in lower Burma, he was compelled by an extraordinary sequence of events to do something he would never have imagined. An elephant went berserk in town, storming a bazaar, and leaving a coolie in agony after stepping on his chest. People expected the white man to do something about it, since the only man in town who could deal with the beast - his mahout - happened to be miles away, chasing the elephant in the wrong direction. Followed by an ever-increasing mob, Orwell found the elephant at the end of a street, peacefully feeding on grass. Evidently, the pachyderm had calmed down and appeared now to be of no harm, but the situation had reached a point of no return: the crowd expected the Imperial Police officer to shoot the beast. Orwell wrote “To come all that way, rifle in hand with two thousand people marching at my heels, and then to trail feebly away, having done nothing — no, that was impossible. The crowd would laugh at me”. 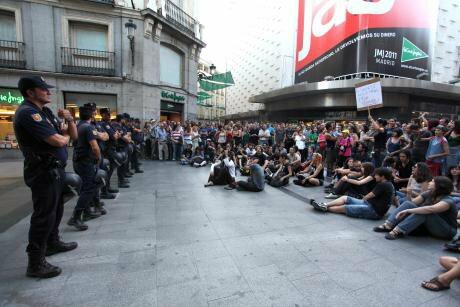 On 15 May 2011, one year after Zapatero had shot his welfare principles elephant, (a date that has come to be known as 15M), a massive protest demonstration against the consequences of the harsh austerity policies resulted in the occupation of Madrid’s central square, Plaza del Sol. In that same month of May young people had taken to the streets in Athens, the “Arab Spring” was in full swing in Tunisia and images of Cairo’s Tahrir square occupation were broadcasted round-the-clock. Thrilled commentators were mesmerised by what looked like the ultimate twenty first century revolution: one taking place live on CNN, through the massive use of social media and the popular occupation of symbolic spaces. Replicas of Madrid’s occupation happened in squares of many other cities throughout Spain, including Barcelona, Valencia and Zaragoza. By the end of that summer, the shockwaves had expanded internationally, reaching their epitome in New York’s Zukotty Park in September when “Occupy Wall Street” made headlines across the globe. In Spain, after a few weeks of chanted slogans and participatory assemblies, most of the occupiers folded their tents up and went home. Local and regional elections had taken place on May 22 and an unexpected victory for the People’s Party left everybody in a puzzle: the popular movement had no immediate direct impact on the polls. The 15M movement did not solidify into one cohesive body but scattered instead in a number of targeted mobilisations against particularly painful issues such as home evictions and severe cuts in public education and health. Many predicted the movement’s death by natural causes, and blamed on its spontaneous character its lack of organisation, which made it impossible for it to canalise the anti-austerity protests’ energy into a political force. A symptom, it was considered, of its lack of traction and its inevitable decay. The Indignados movement was both an expression of popular anger and an amalgam of grassroots movements, leftist fringes and social activists, mobilised students and committed academics conducting experimental field work. All the anger did not, however, vanish like a storm cloud. Instead, the activists resumed their political crusade with renewed energy and hope for real change. A number of campaigns kept the spirit of the 15M alive and kicking under powerful and often diverse expressions, depending on the local circumstances. From the “green tide” against hospital privatisations in Madrid (green being the colour of the robes of the medical staff in public hospitals) to huge pro-independence mobilisations in Catalonia, political effervescence took to the streets. In the following months and years, far from receding, it snowballed as the economic crisis worsened into the Euro Crisis and the citizens’ political disengagement and distrust deepened. The mainstream political parties, in government or in the opposition, having lost any margin of maneuver to that scary ghost named Troika, paid a huge price for enduring their austerity policies regardless of their catastrophic social consequences. The diagnosis of the situation by political and social scientists at universities and research centers was accurate enough: the ground was set for a new political party to be born. The party would be one that could grow out of the people’s indignation, would catalyse the different movements into one big political thrust aimed at the mainstream political parties and would try to make change happen by swiftly grabbing power. As a result, in January 2014, the Podemos party was founded by a number of university professors and left-wing militants and gathered a surprising 1.25 million votes (8%) only four months later, at the European Elections. Whilst not everybody who participated in the15M mobilisations felt represented by the new party, everybody at Podemos had, in one way or another, been involved in the 15M. Four years later, on the eve of new local and regional elections on May 24, a number of candidacies have been put up in all the major Spanish cities, with the direct or indirect involvement of Podemos. “Ahora Madrid” (Now Madrid) or the “en Común” (For All) platforms in Barcelona, Valencia and Zaragoza – the very same cities where the 15M took place - are expected to get spectacular results. The CIS, one of the most serious polling institutes in Spain, is even predicting an eventual victory in a number of towns. The volatility and fragmentation of the political landscape, however, and the high number of people who are yet undecided, together with the rise of other alternative parties like Ciudadanos, makes any prediction a very risky business at this point. Without any doubt a number of those who where spontaneously occupying the central squares of major Spanish capitals four years ago are now going to win a seat at their city councils or regional parliaments. If only one of those 15M militants is able to become a mayor, or a regional president, it will be a tremendous achievement for an originally unarticulated and spontaneous Indignados movement. Maybe then, as it seemingly ends up happening to any politician in power, the day will come when he or she will have to “shoot an elephant” - hopefully this time for a good cause.